This exercise is intended to intensify the abdominal work of the single toe tap exercises while maintaining pelvic stability. 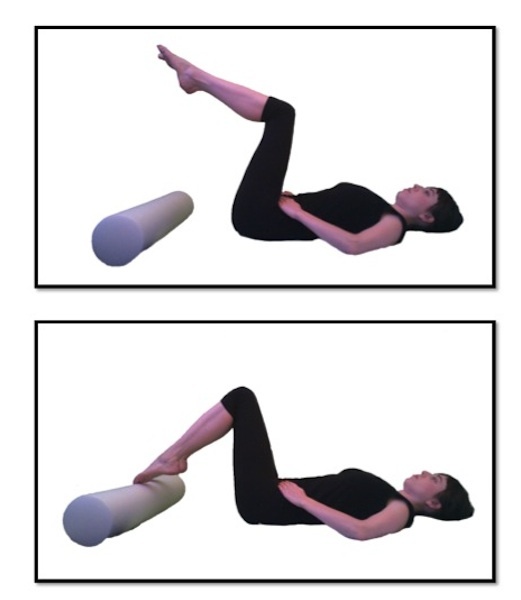 The foam roller lessens the range of motion. It is imperative when doing this exercise to be sure that your spine remains neutral and that your pelvis doesn’t follow your legs. It is also important to make sure that you release all of the air from your lungs as this will ground the ribcage to the mat so that the back doesn’t arch. Squeezing the inner thighs assists the body in finding the pelvic floor, but be sure that you are squeezing the inner thigh muscles together and not the knees. This will ensure that you are not internally rotating the legs at the hips.